Camelot Equestrian Centre is located in north central Iowa, 15 miles south of the Minnesota border and about 4 miles west of Interstate 35. For 20+ years Camelot Equestrian has been involved with riding lessons, boarding horses, and showing in the hunter/jumper discipline. Many winning horse/rider combinations have enjoyed personal achievements and memorable showing experiences. Adults and children and all riding levels can learn and grow at their own pace. Camelot has staff to take a rider to whatever level they aspire in a safe manner to help them grow as an equestrian and person. The strive to keep a low-keyed atmosphere in our lesson program steering toward individual needs. Look at our horses/riders at play. Dedication, love for what I do and 12+ years of breeding experience inspires me to breed quality Boxers, Cavalier King Charles Spaniels, Chow Chows, and Cavachins at Camelot Kennels. Puppies go to their new families healthy, sound, and well socialized. All breeding programs are based on knowledge, experience and the commitment to produce excellent puppies so new families can enjoy years of love and companionship. My dogs live in a climate controlled kennel and enjoy full range access to my farm as you can see when you view my dogs at play. 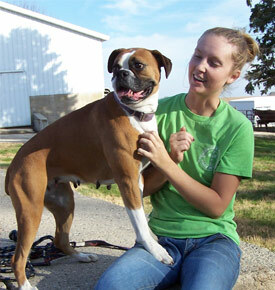 They are also house trained with basic obedience training. I have had wonderful success placing retired dogs with adoptive families; not everyone wants a puppy. I live in Iowa yet anyone can have one of my awesome puppies; we ship in the United States and Canada via air.